If you’re a regular ‘Morning Becomes Eclectic’ listener on KCRW, then you’ve probably found yourself enamored with the voice of Alabama Shakes’ lead singer Brittany Howard. She oozes soul and raw emotion, evoking shades of Dap Kings frontwoman Sharon Jones. The Shakes are from you guessed it, Alabama and have put together a unique blend of soulful Southern blues rock that’s drawing critical acclaim, namely by wowing crowds at SXSW. One final Easter Egg, a link to their entire Morning Becomes Eclectic set, where you can either listen in or watch the live studio session. I highly recommend the KCRW iphone app, which boasts a live stream, the Eclectic 24 station and has archives of all in studio performances from MBE (recent highlights include Sharon von Etten, Cate Le Bon and Tycho ). 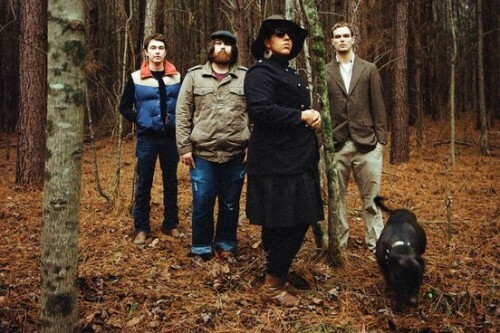 The Alabama Shakes‘ debut LP ‘Boys & Girls’ is officially released tomorrow, April 10th.